It's been a long time coming, but after dabbling with touch on the midrange 5800, Nokia has finally brought a touchscreen to an S60 "N-Series" smartphone, the N97. Take a look at our hands-on impressions and the complete rundown on Nokia's new flagship. But it's not quite a full dive into touch-there's still a horizontal QWERTY keyboard hidden below the 3.5" 640x360 resistive touchscreen and accesable via a smooth 30° flip mechanism. 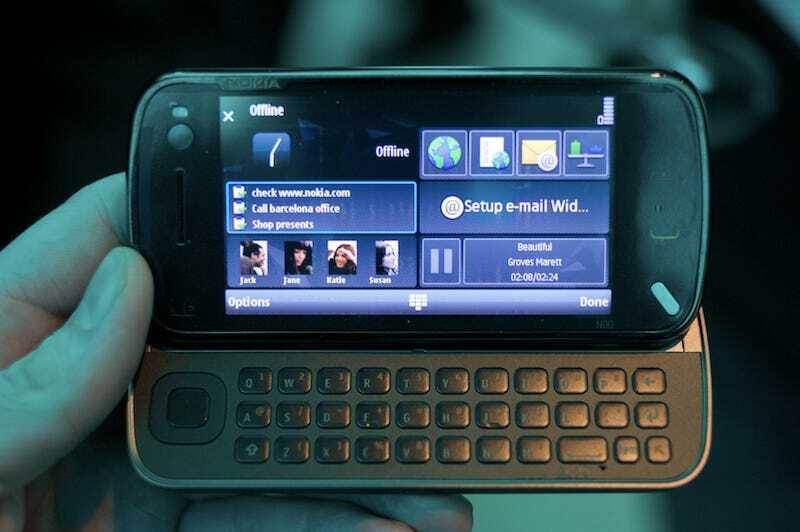 The N97 will run an even further touch-enhanced Symbian OS, S60 v5, which features the 5800's quick contacts bar and adds an assortment of customizable desktop widgets that can pipe in your Facebook info, RSS feeds and the like, much like those found on Nokia's internet tablet OS. The widgets will be open to third party developers and available via the traditional "Downloads" Symbian app "for now" says Nokia-so not quite the App Store equivalent fans would hope for, but customization via software add-ons is definitely the route being pursued here. But alas, the downsides. Characteristically for Nokia, the N97 is aimed at Europe and Asia first. So big ballers in Moscow and Macau can expect to be toting an N97 sometime in the "first half of 2009," with a U.S. release (with the appropriate 3G bands) to follow "soon after." In Europe it'll run a hefty €550 ($695) unsubsidized. The model we briefly handled tonight in NYC was, of course, the Euro version, with no U.S. 3G (and, sadly, no Wi-Fi network availabile). Its handlers were keeping it close to the vest, and with no connectivity there wasn't much testing to be done, but we can say that the hardware is indeed pretty-befitting a $700 Nokia piece. The desktop Symbian widgets look nice, but the drawbacks of a resistive touchscreen (there, as always, to ensure character recognition via a stylus for Nokia's Asian market) were immediately noticeable when dragging widgets around the desktop. A resistive touchscreen relies on pressing two layers of screen together with a fingernail or stylus to register a signal, so it is not as responsive as a capacitive screen which is driven by the natural electricity in your fingers (more on the difference here). Rounding out the gaudy specs are 32GB of on-board memory (with 16GB more available via microSD), A-GPS with Nokia's refreshed Maps 3.0 app and a compass, accelerometer for landscape/portrait screen switching, 5MP camera with Zeiss lens and LED flash, 3.5mm headphone jack, and N-Gage support. Tilting touch display, QWERTY keyboard and personalized home screen - a true mobile computer. "From the desktop to the laptop and now to your pocket, the Nokia N97 is the most powerful, multi-sensory mobile computer in existence," said Jonas Geust, Vice President, heading Nokia Nseries. "Together with the Ovi services announced today, the Nokia N97 mobile computer adjusts to the world around us, helping stay connected to the people and things that matter most. With the Nokia N97, Nseries leads the charge in helping to transform the Internet into your Internet". The Nokia N97 introduces the concept of ‘social location'. With integrated A-GPS sensors and an electronic compass, the Nokia N97 mobile computer intuitively understands where it is. The Nokia N97 makes it easy to update social networks automatically with real-time information, giving approved friends the ability to update their ‘status' and share their ‘social location' as well as related pictures or videos. The home screen of the Nokia N97 mobile computer features the people, content and media that matter the most. Friends, social networks and news are available by simply touching the home screen. The 16:9 widescreen display can be fully personalized with frequently updated widgets of favorite web services and social networking sites. The Nokia N97 is also perfectly suited for browsing the web, streaming Flash videos or playing games. Both the physical QWERTY and virtual touch input ensure efficiency in blogging, chatting, posting, sending texts or emailing. The Nokia N97 supports up to 48 GB of storage, including 32 GB of on-board memory, expandable with a 16 GB microSD card for music, media and more. This is complemented by excellent music capabilities, full support for the Nokia Music Store and continuous playback time of up to 1.5 days. The Nokia N97 also has a 5- Megapixel camera with high-quality Carl Zeiss optics, 16:9 and DVD quality video capture, and support for services like Share on Ovi for immediate sharing over HSDPA and WLAN. The Nokia N97 is expected to begin shipping in the first half of 2009 at an estimated retail price of EUR 550 before taxes or subsidies.